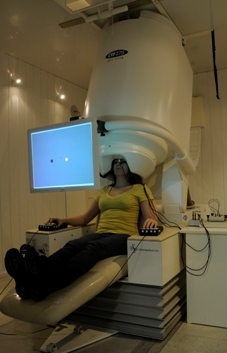 The Magnetoencephalography system (MEG) was installed at the Université de Montréal in 2005. It was funded by a Canadian Fund for Innovation grant. The unit is a 275-sensor system manufactured in Canada by CTF Ltd. It can simultaneously collect Electroencephalography (EEG) data. SEE ALSO: What Is MEG? WHAT DOES A MEG SYSTEM LOOK LIKE? Left: Example of a MEG unit; notice the adjustable seat and projector-style presentation device (which uses a set of mirrors). Right bottom: Photo of the MEG laboratory while it was being installed in 2005 (the white cylinder is the Dewar -- see below; the subject's head sits just inside but not touching the concave area at the bottom). 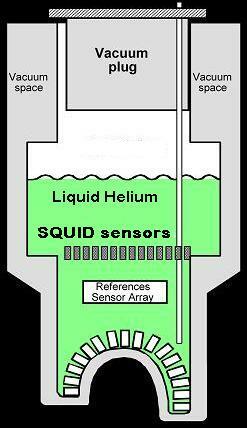 Above: Schematic of a MEG system showing liquid Helium container, vacuum areas and the SQUID (Superconducting Quantum Interference Devices) sensors Below: The inner compartment of the Dewar (shown during installation) is filled with helium, which super-cools the sensors so that they become superconducting and can pick up the very faint magnetic signals emanating from the brain. 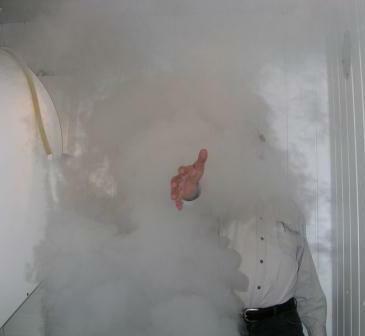 The vacuum is required as insulation to maintain the very low sensor temperature and to ensure that the person in the device cannot feel the cold. The signals are amplified, digitized and sent to a computer for recording. WHAT TECHNICAL DIFFICULTIES ARE INVOLVED IN OBTAINING ACCURATE MEG DATA? First, because the signals are so small (1 billionth that of the earth's magnetic field), all sources of noise contamination must be dealt with. On the left, the two sensor coils are wound in opposite directions, effectively cancelling the effect of far away fields and keeping only close-by cortical magnetic fields. The entire MEG booth is shielded by a special metal cladding that is grounded (noise from electrical devices, motors, etc. is effectively blocked). Reference sensors also eliminate far sources. Secondly, even small movements of the subject's head must be compensated for in the data. Localization coils provide the position information needed for this. Thirdly, ocular artefacts (blinking and eye movements) are orders of magnitude greater than the actual data. The four right columns contain a graph of the data from each of the sensors and most have a disturbance midway (the red and blue circles on the spherical view of the top of the brain at this time show that this dominates any other data. They are removed by sophisticated software. WHAT STEPS ARE NECESSARY TO ANALYSE MEG DATA? Visual Inspection of Data: This quality control step prevents wasted time analysing data that have an inherent problem. Artefact rejection: The biggest artefact is due to eye blinks/movements (see above). Filtering: Extraneous noise is unavoidable due to the very small signals and must be minimized in this step. Segmentation: Trigger signals that encode which experimental condition is occurring are sent at critical points in each trial are used to break the data down into trial-by-trial segments. Baseline Correction: The signals may float up and down due to the very sensitive nature of the sensors. Here each trial is adjusted to start at the same approximate value since it is the change over the course of the trial that is significant. Event-Related Averaging: If you examine the data in each trial, it is nearly impossible to see any trend due to the many operations occurring simultaneously in the brain (much like the 'squiggles' on either side of occular artefacts in the graphs above). But, when many trials with the same experimental condition are averaged and aligned in time to an event marker, a smoother trace is obtained. This average exhibits the aspects common to each trial in the particular condition being averaged. Identification of Components: This is an involved mathematical and experimental analysis of the resultant curves. Scientists continue to identify useful common components of the various brain functions. For example, an unexpected element in a series of presentations can generate a well-defined peak, which can be modulated to study attentional effects. Many of the MEG components have corresponding components in EEG (eg. the so-called N1 in EEG (negative peak at approximately 100 milliseconds after the stimulus) has a similar component in MEG, the N1m. Dipole Modeling: When two adjacent regions of magnetic activity have opposite polarity, there is an electrical dipole between them, indicating a concentration of neuronal activity. See the diagrams in What Is MEG? Co-registration on Anatomical MRI maps: MEG data can be combined with MRI (and EEG) data to provide not only a more complete picture but a more accurate one since the various data support each other. Group warping: We all have similar but different brain structures. MEG data can be 'warped' so that it can be overlaid on an 'average' 3-dimensional brain structure so that group averages can be obtained, and statistical significance can be computed to allow researchers to make conclusions about our brain functions. In fMRI terminology, this is called 'co-registration in a standard stereotaxic space'. Other Analyses: Time-frequency methods (wavelets) and Synchrony (see Oscillatory Activity in VSTM), Source separation techniques (ICA, PCA, etc. ), Beamforming, etc. NOTE about printing/saving: This site is created with Frames. Use Print Preview and print each frame individually. Change the file name when saving different pages. Last update: Septembre 3, 2010.